Subclavian steal syndrome (SSS) is a rare complication in the pediatric age group following manipulation of the subclavian artery in the correction of congenital heart disease. SSS has been reported following coarctation repair,  classic Blalock-Taussig shunt procedure for Tetralogy of Fallot, congenital lesions of the aortic arch or subclavian artery, Takayasu disease, and temporal arteritis. We present a unique case of a 19-year-old male who developed SSS, as a delayed complication of coarctation repair in infancy. A 19-year-old young man status post repair of transposition of the great arteries (TGA) had a coarctation repair using a subclavian flap procedure at 3 months of age. During a recent follow-up exam at 18 years of age, he was noted to have mild upper extremity hypertension, good femoral pulses, and a mild discrepancy in his blood pressures and pulses with right arm greater than the left. He was placed on enalapril for his hypertension. Cardiac catheterization showed findings consistent with previous repair of his TGA, dilated aortic root with aortic incompetence, and no residual coarctation. A year later, he developed gradual onset of dizziness that was exacerbated by the use of his left arm. The patient also developed headaches, blurring of vision, confusion, and an acute syncopal episode while walking to school, which prompted admission and work-up. On examination, a grade 2-3/6 diastolic murmur was noted. His blood pressure in the right arm (127/72) was higher than the left (113/69) and the right arm pulse was stronger than left arm. Neurologic exam at baseline was unremarkable. The patient reported that his dizziness improved when the left brachial artery was compressed. Brain MRI with angiography showed no acute changes. Chest CT angiogram [Figure 1] demonstrated the patient's anatomy status post subclavian flap, with the proximal left subclavian artery dissected away from the aorta and the left vertebral arising distally from the subclavian. [Figure 2] shows the patient's carotid artery Doppler ultrasound, which demonstrates retrograde flow in the left vertebral artery consistent with left subclavian steal and continued retrograde flow in the left vertebral artery with left arm exercise. The patient underwent a hyperemia test with no significant change in his systolic blood pressure (SBP) in right arm (119 mmHg to 118 mmHg). However, his SBP dropped from 107 mm Hg to 102 mmHg in the left arm. [Figure 3] shows the patient's aortic angiogram demonstrating prograde flow across the right common carotid, right subclavian, right vertebral artery, and left common carotid and delayed retrograde filling of the left vertebral artery to the distal left subclavian artery. There was no proximal left subclavian artery noted consistent with his earlier left subclavian flap angioplasty for repair of coarctation. 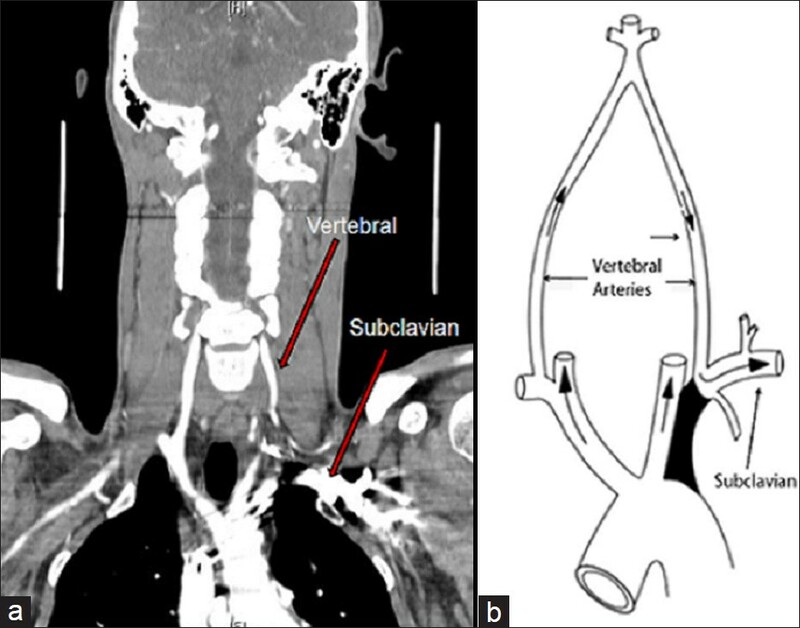 Figure 1: Chest CT angiogram and diagram demonstrating vertebral and subclavian anatomy following subclavian flap procedure (a) CT angiogram showing subclavian root dissected away from aorta and vertebral artery arising distally from subclavian (b) Diagram showing blood flow that results when subclavian artery is obstructed. Figure 1b reprinted with permission from Lee S et al., Simultaneous coronary-subclavian and vertebral-subclavian steal syndrome, Circulation 2003;67(5):464-6. The patient underwent left common carotid-to-left subclavian bypass surgery using a 8-mm Dacron graft. The patient did well with complete resolution of his neurological symptoms following surgery. CT angiography of the chest [Figure 4] showed a patent bypass between the left common carotid and left subclavian arteries. 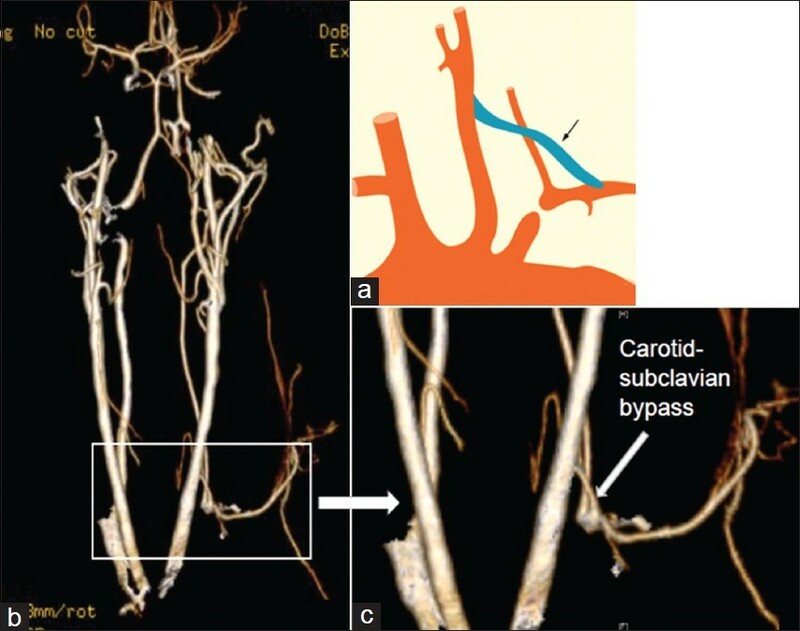 Figure 4: 3D CT angiogram of chest/neck vessels showing carotid-subclavian bypass (a) Diagram demonstrating an idealized carotid-subclavian bypass. (b) Head/neck CT angiogram of the patient showing 2 common carotids. (c) Expanded view of lower right segment demonstrating left carotid-left subclavian bypass. Figure 4a reprinted with permission from Therasse E et al., Stent- Graft Placement for the Treatment of Thoracic Aortic Diseases, RadioGraphics 2005;25:157-173. Retrograde blood flow in the vertebral artery associated with stenosis of the subclavian artery was described in the 1960s  and Fisher first coined the term "subclavian steal" to describe neurological symptoms as a result of subclavian stenosis or occlusion and arm exercise. SSS is a rare complication of subclavian flap angioplasty for the repair of coarctation. This occurs when retrograde collateral flow is established to the left arm at the expense of a "steal" from the vertebral system of the brain resulting in neurologic symptoms, particularly with left arm exercise. Neurologic symptoms due to SSS are rare in patients and not all patients with retrograde flow in the vertebral artery develop symptoms. Our patient developed SSS 19 years post-operatively. We hypothesize that the delayed presentation occurred as it takes time for reversal in the vertebral artery to become symptomatic, particularly as patients get older and become more active. Carotid-to-subclavian bypass has been well described as a repair for various causes of subclavian stenosis like atherosclerosis in the adult population. To our knowledge, this is the first reported case of congenital heart disease repair resulting in SSS in a young adult, which was successfully treated with left carotid-to-left subclavian artery bypass. The bypass surgery promotes prograde flow through the vertebral artery, alleviating symptoms. In conclusion, patients with a history of subclavian artery manipulation in the correction of congenital heart disease are at risk for subclavian steal and this should be considered in the differential diagnosis when a patient presents with dizziness, syncope, particularly with left arm exercise, and is noted to have asymmetric weak left upper extremity pulse and differential arm blood pressures. 1. Saalouke MG, Perry LW, Breckbill DL, Shapiro SR, Scott LP. Cerebrovascular abnormalities in postoperative coarctation of aorta: Four cases demonstrating left subclavian steal on aortography. Am J Cardiol 1978;42:97-101. 2. Elmaci TT, Onursal E, Aydoðan U, Dindar A. Congenital subclavian aortic steal syndrome: Hypoplastic aortic arch with severe coarctation of the aorta of unusual location. Ann Thorac Surg 2000;70:291-2. 3. Lee S, Jeong MH, Rhew JY, Ahn YK, Na KJ, Song HC, et al. Simultaneous coronary - subclavian and vertebral - subclavian steal syndrome. Circ J 2003;67:464-6. 4. Therasse E, Soulez G, Giroux MF, Perreault P, Bouchard L, Blair JF, et al. Stent-graft placement for the treatment of thoracic aortic diseases. Radiographics 2005;25:157-73. 5. Gaca AM, Jaggers JJ, Dudley LT, Bisset GS 3 rd . Repair of congenital heart disease: A primer-part 2. Radiology 2008;248:44-60. 6. Contorni L. Il circolo collaterale vertebro-vertebrale obliterazione dell'arteria succlavia alla origine. Minerva Chir 1960;15:268-71. 7. Fisher CM. A new vascular syndrome: "The Subclavian Steal". N Engl J Med 1961;265:912-3. 8. Wittwer T, Wahlers T, Dresler C, Haverich A. Carotid-subclavian bypass for subclavian artery revascularization: Long-term follow-up and effect of antiplatelet therapy. Angiology 1998;49:279-87.